In her second adventure, Princess Truly's magical curls and belief in herself transport her back in time and help her reach for the stars! I love my fluffy, puffy curls. I'm so happy they are mine. They shimmer and they shine. Princess Truly is back! 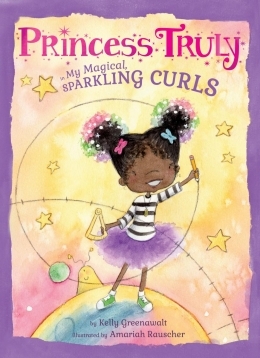 In the second Princess Truly adventure, Truly's magical, sparkling curls have the power to transport her to exciting new places like the Egyptian pyramids, the Jurassic period, and even into outer space. With curiosity, bravery, and her signature smarts, Princess Truly once again proves that she can do anything she sets her mind to and reminds girls everywhere to reach for the stars, believe in themselves, and dream big! Princess Truly has amazing hair. They are fluffy and puffy and can take her anywhere. Her imagination is top notch as she explores whatever her mind can dream up like flying across the galaxy or exploring the ocean floor. She can even go to Egypt and crack the code of all those hieroglyphics "written long ago". Truly starts a band and plays rock and roll to a crowd that cheers really loud. I love Truly! Her fluffy, fluffy puffy hair is perfect! She believes in herself and can do whatever she sets her mind to.